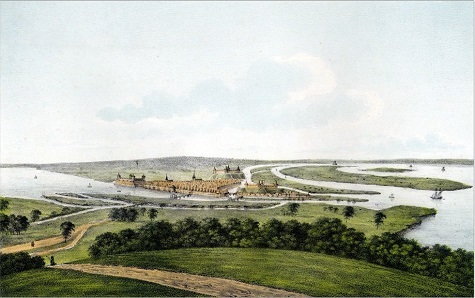 The area around the Free City of Hamburg has been continuously inhabited since ancient times. It is located in the extreme northwestern part of the region referred to by Roman maps as Germania Magna. In the 2nd Century, the Romans referred to the area near the confluence of the Elbe and Alster Rivers, inhabited by Saxon tribes, as "Treva", meaning "large homestead" or "large settlement". During the 8th Century, the Emperor Charlemagne ordered the construction of a castle on the rocky terrain in a marsh between the confluence of the Elbe and Alster Rivers, as a defense against Slavic incursions. The castle eventually became known as "Hammaburg", with the Old Saxon word "Hamme" meaning "forest", and "burg" meaning "castle" or "fortress". It is believed that the fortress was built on the site of an earlier Saxon village called Hamm. The original site of this castle has only recently been discovered, and some excavations have begun. The castle was in the vicinity of today's Cathedral Square in Hamburg. 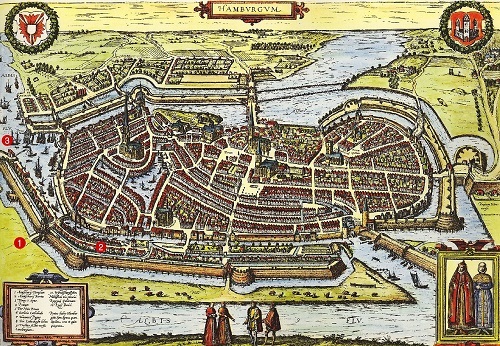 The little Elbe River town of Hamburg, with a population of about 500 during the 9th Century, had some difficult times during its early existence. During the middle of the 9th Century, the town was overrun by Viking invaders sailing down the Elbe River. During the early part of the 11th Century, the town was destroyed by Polish invaders, and near the beginning of the 13th Century, it was attacked by Danish invaders. But, for the determined residents of Hamburg, their GREATEST DAYS would soon be coming! Within the next couple centuries, Hamburg would rise to become one of the top economic powers of Europe. In 1189, Holy Roman Emperor Frederick I "Barbarossa" issued an imperial charter proclaiming Imperial Free City status to Hamburg, as well as tax-free access up the Lower Elbe River to the North Sea. In the Middle Ages, Imperial Free Cities were sovereign city-states. They could establish their own governments, levy taxes, form their own trade alliances, and manage their own territories. Imperial Free Cities were subordinate only to the Holy Roman Emperor, whereas regular cities and towns were subordinate to a territorial lord or prince. The Free City of Hamburg, with the advantage of its sovereign status, and combined with its close proximity to the North Sea and the Baltic Sea, became one of the major ports of Northern Europe by the middle of the 13th Century. In 1241, the Free City of Hamburg entered into a trade alliance with nearby Lubeck, which had become a Free City in 1227. This alliance marked the origin and the core of the powerful Hanseatic League of trading cities. The Hanseatic League, which flourished from the 13th to the 17th Century, was a commercial confederation of merchant guilds and their market towns which dominated trade along the coasts of Northern Europe. The league was created to protect economic interests and diplomatic privileges in the cities and countries along the trade routes the merchants visited. From this time, the official name of the Free City of Hamburg, became "Freie und Hansestadt Hamburg" or, in English, "Free and Hanseatic City of Hamburg", a title that the city of Hamburg retains to this day. In fact, today, Hamburg is considered a STATE of the Republic of Germany. 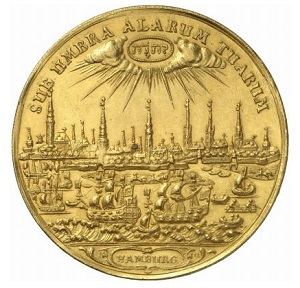 The 17th Century gold coin shown at the left shows a beautiful rendition of the port of the Free City of Hamburg. The port became one of the most significant economic producers of Hamburg. Even though Hamburg is on the Elbe River, 68 miles from the North Sea, its deep-water port can easily handle large ocean-going vessels. By the late 19th Century, the port was the second largest in Europe, being surpassed only by Rotterdam, and the 9th largest in the World. Hamburg also became the commercial center of Northern Europe and the most important banking city of Northern Germany. The Hamburg Mark, equivalent to 32 Hamburg Schillings, was traded in many neighboring countries, alongside their own currencies. The coin at the right was issued in the name of the Holy Roman Emperor, Ferdinand II. 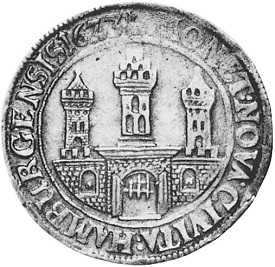 The reverse of the coin, shown here, features the arms of the Free City of Hamburg, along with a Latin inscription meaning "new coin of the City of Hamburg". Hamburg went through some tough times during the 20th Century, but today, it is ranked as one of the most affluent cities in the World.